From the initial idea of adding radiant heat to your new or existing home to the actual purchase and installation can be somewhat intimidating for homeowners. Where do you start? What should you be looking for, and what are the options? Judging from past customers, radiant heat is a proven, worthwhile investment that provides very efficient and luxurious warmth using clean renewable energy. Radiant heated floors continue to gain popularity because of their efficiency as well as the rich, comfortable heat that they produce. Find a provider that includes complete system design services and a large selection of products and services – from different manufacturers. Warmzone is one provider that offers a dynamic range of radiant floor heating systems. Because of the diverse selection, Warmzone can evaluate your specific needs and recommend the system that will best meet your budget and heating demands. So, if you’re considering installing a heated floor, view Warmzone’s Floor Heating Overview web page to gain some general information about the different systems. Then call a Warmzone representative to discuss the various possibilities and the advantages of each system (888.488.9276). Our staff features experienced professionals who are happy to consult with prospective customers without any pushy sales pressure. Warmzone includes professional installation support services. And when it comes to customer service, you won’t find a provider that offers better customer services. Warmzone services include FREE installation training for installers, detailed system design and layout services, technical support, free consulting, and a wealth of online documentation, videos and information resources. We take pride in our unparalleled personal services as well as our industry leading products. 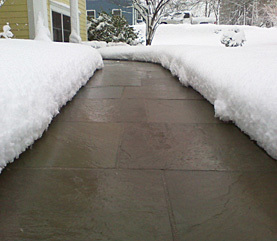 Warmzone snow melting systems are also among the very best available. Warmzone continues to be a leader in offering the latest technology with the most trusted and proven systems. 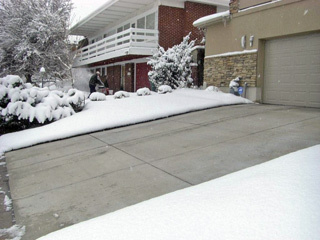 Warmzone heated driveways and snow melting systems are easy to customize to match the budget and performance requirements of each customer. ClearZone heat cable is the longstanding backbone of Warmzone’s exceptional snow melting systems. 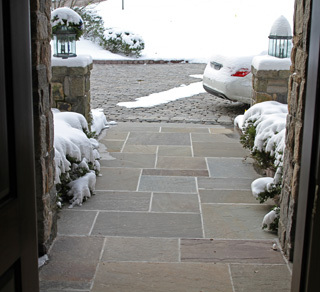 In addition to the heating element, Warmzone driveway heating systems also feature a contactor panel/controller and either a ground-mount snow sensor or an aerial mount sensor. These advanced activation devices detect precipitation and temperature, so when conditions warrant, the sensor triggers the system and the driveway begins to heat. The system continues to operate for a short time after the storm to ensure that the driveway is dry, eliminating slick, dangerous ice. Fully automated, energy efficient, and featuring quiet, clean operation, Warmzone snow melting systems continue to be a favorite among contractors and professional installers. For more information, call us at 888.488.9276 and speak with a radiant heat consultant. Also take advantage of our online information resources and view radiant heat installation videos, monthly newsletters, product literature and more. We think that the more you research and compare radiant heat companies, the more impressed you’ll be with Warmzone. Call or email us today for a free quote. Good help is truly hard to find for most of us. Using the phone book to find a radiant heat installer seems like a game of contractor roulette. Just how do you know that what you’re paying for is truly what you’re getting, or that the provider you choose will be reliable enough to complete the job once it’s started? When you’re ready to do a radiant heat installation, remember that any system is only as good as the installation. It pays to shop a radiant heat provider who offers a one-stop shopping experience, plus the top-notch solutions and radiant heat installation support services to back them up. Many radiant heat providers may claim to offer installation support, when in fact, they have no dedicated support staff to follow through with their claims. These businesses will say all the right things to get you to buy, but after the purchase, the nightmare often begins. Experiences like this are eliminated by working with a company like Warmzone. Unlike most other providers, Warmzone has expert electricians, designers, and engineers who are on hand specifically to work with you during the installation process. Furthermore, Warmzone maintains relationships with a large network of experienced installers who can be recommended to help make your radiant heat installation a smooth transaction from start to finish. In other words, Warmzone is committed to its customers and installers throughout the entire purchase, design, and installation process. You simply won’t find a more dedicated, accommodating and professional staff to work with. If you are looking to install heated floors, a heated driveway or a roof deicing system, Warmzone offers one of the largest selections of top industry products to best meet your specific heating (and budget) needs. To further bolster peace of mind, Warmzone can refer to its network of experienced radiant heat installation professionals and recommend an installer you can trust. But Warmzone doesn’t leave at this point. Their seasoned electricians and designers will continue to be available to your installer to assist whenever needed. Warmzone stays with you to ensure that the installation process goes smoothly and that your system is performing as advertised. While the correct installation of your radiant heat system is first and foremost, the other key factor lies in the quality of the products and design of the system. Warmzone constantly researches and tests the latest products to ensure that their vast selection includes only the industry’s most proven, reliable products. Heating elements include low and line-voltage heat cable, flexible polymer elements, durable self-regulating heat cable, thin FilmHeat, and even hydronic radiant heating products. Warmzone systems have been installed in large commercial and custom residential projects throughout Northern America for over a decade – and in virtually every conceivable radiant heat application. Dealing with a large and highly reputable radiant heat provider like Warmzone has its perks. With so many products to choose from, you not only are assured of the right fit for your project, but you’re likely to be able to get a custom radiant heat solution at a considerable savings. Installing heated floors? In addition to its wide selection of floor heating products, Warmzone carries two of the industry’s most trusted and popular floor heating systems. The ComfortTile heat cable (and mats) and FloorHeat low-voltage floor heating systems have been installed under virtually all types of flooring material. Installing roof deicing? You’ll find plenty of custom solutions available for both new construction and remodeling projects. Warmzone’s roof heating systems are among the best when it comes to ease of installation, performance, and efficiency. Eliminate ice dams and protect your roof by melting snow and ice in roof valleys, roof edges, gutters, and more. Installing a heated driveway? Warmzone offers snow melting solutions for all types of snow melting projects and applications, from small residential driveways to large commercial parking structures and ramps, city sidewalks, loading docks, driveways, steps, etc. Besides high quality products at competitive prices, Warmzone provides unmatched customer service and complete design and engineering services along with free installation training and expert installation support. Upon request, your radiant heat solution will come with a detailed, professional system design. Basically, you’ll know all the specs and power needs as well as performance expectations prior to any installation. You can also access a complete online library of installation support information including manuals, product guides, illustrations, installation videos, and more for your projects. It’s free and available whenever you need it. Finding the right contractor to install your radiant heat system can be a risky proposition. Many contractors are just getting up to speed on radiant heat. Take heart—if you’re looking for help with your radiant heat installation, you don’t have to go it alone. Warmzone has a robust network of experienced installers who have established a reputation of trust. Warmzone maintains relationship with these installers and have worked with them in the past, so the trepidation of finding a qualified installer you can trust is virtually eliminated. Warmzone can find the ideal installer for you, whether you’re installing heated floors, roof deicing or a heated driveway system. Installers in Warmzone’s network are familiar with installing Warmzone products and have proven themselves with prior installation projects. Sure, like any home improvement project, radiant heat installation has its challenges. But with a wide product selection, professional system design services, and a large network of experienced installers and a dedicated installation support staff, Warmzone makes it easy for homeowners and contractors alike! Visit www.warmzone.com or call 888.488.9276, and install your radiant heat system with confidence. Keep Your Decorative Concrete Looking Like the day You Installed it! When installing decorative concrete, the installer can’t help but wonder, “How long is my work going to last?” One concern may be that in the winter the owners will use snow removal methods that will eventually fade or destroy the beautiful decorative concrete. But what if there was a way for the customer to never lay a snow plow blade, shovel, or snowmelt chemical on the concrete? Would this be worth the slight extra cost for the customer now versus replacing the whole driveway later? There is a solution, and contractors can partner with Warmzone in getting their clients to “go green” and avoid harsh chemicals and salt to remove snow and ice. What Warmzone offers is a new way to utilize an old technology which has re-emerged in the last 50 years in Europe as a great alternative to other heating methods – radiant heat . Radiant heat can be used outdoors for melting snow and ice, and indoors to heat the house. There are two technologies that are associated with radiant heat: hydronic, which uses hot water to heat an area; and electric radiant heating, a newer technology that is quickly emerging as a great way to heat homes and keep driveways clear of snow and ice. Set yourself apart from your competition by offering these specialty products for your clients’ decorative concrete projects. It won’t change the normal installation process and can significantly add to your bottom line. Set up of either radiant heat system is fairly simple while installing the concrete. You just install the cables or PEX pipes directly where you will pour the concrete, hook them up to a controller that is connected to a sensor, set the controller or thermostat and let it go to work. This efficient, even heat source will melt the snow and heat the floors and can reduce heating costs and stress for your customers when the weather outside turns dreary. To learn more about Warmzone and what they can do for you and your clients, please search the site further or call a sales representative at 888.488.9276.